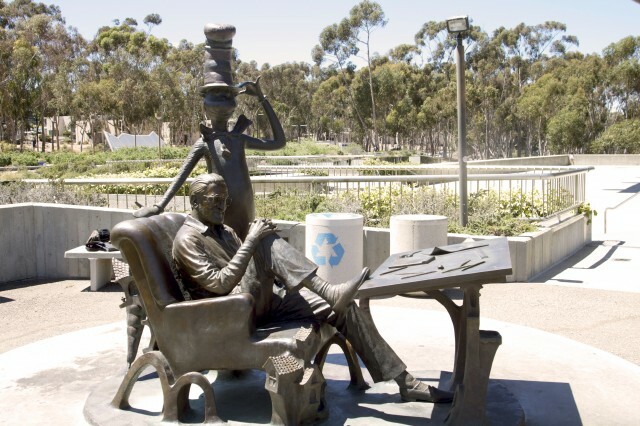 This week, Arts Month San Diego is highlighting the cultural neighborhood of La Jolla. 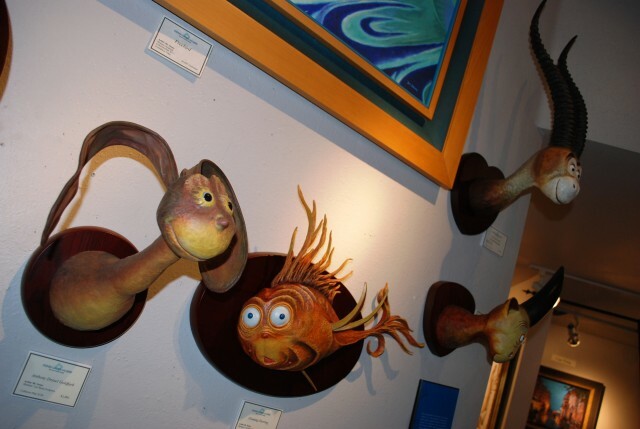 We all know La Jolla for its beautiful beaches, fine dining options, shops, and beautiful scenery – but it also offers significant cultural institutions, including the La Jolla Playhouse and the La Jolla branch of The San Diego Museum of Contemporary Art. 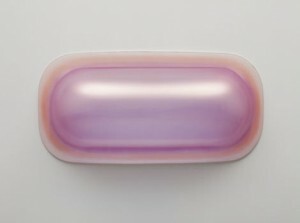 Craig Kauffman , Untitled, 1968, synthetic polymer vacuum-formed plexiglass with acrylic lacquer, overall dimensions: 23 x 51 x 12in., Collection Museum of Contemporary Art San Diego, Gift of Arthur and Carol Goldberg in honor of Margo Leavin. Phenomenal: California Light, Space, Surface: Spanning both Museum of Contemporary Art locations in downtown San Diego and La Jolla, Phenomenal takes an in-depth look at 13 rising artists working in Los Angeles in the 1960s and ’70s whose perceptual investigations and work with light and innovative materials helped define an era of art making in California. 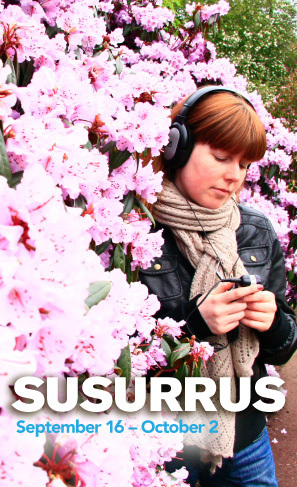 Susurrus: Presented by the La Jolla Playhouse (September 16-October 2) and held at the lush San Diego Botanic Garden in Encinitas, the Tony Award-winning La Jolla Playhouse launches an innovative, site-specific Without Walls (WoW) program that is part radio play, part avant-garde sonic art and part stroll in the park. 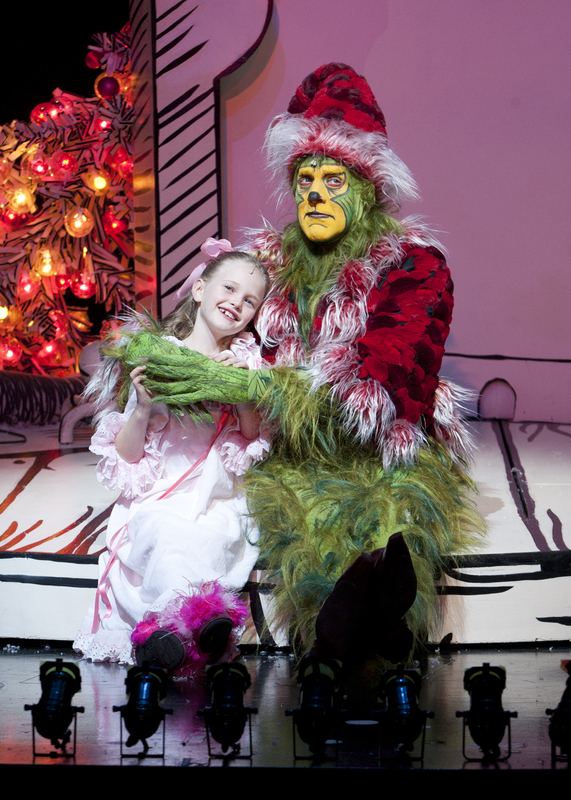 Without actors or stage, audiences experience a subtly woven narrative by listening on iPods and hear the play unfold while following a mapped route through the gardens. 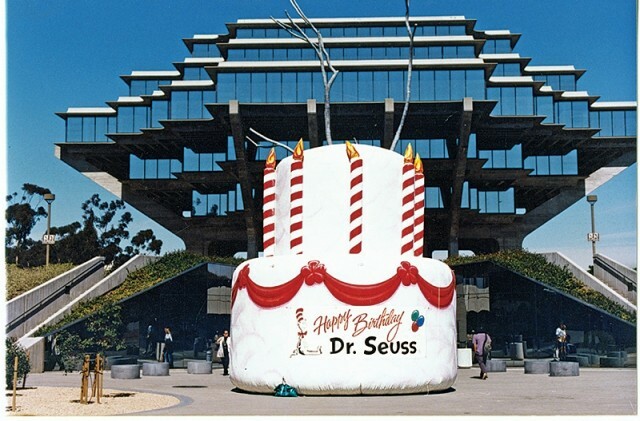 UCSD – Stuart Collection: The Stuart Collection is a collection of public art on the campus of the University of California, San Diego. Founded in 1983, the Stuart Collection’s goal is to spread commissioned sculpture throughout the campus, including both traditional sculptures and integration with features of the campus such as landscaping and buildings. 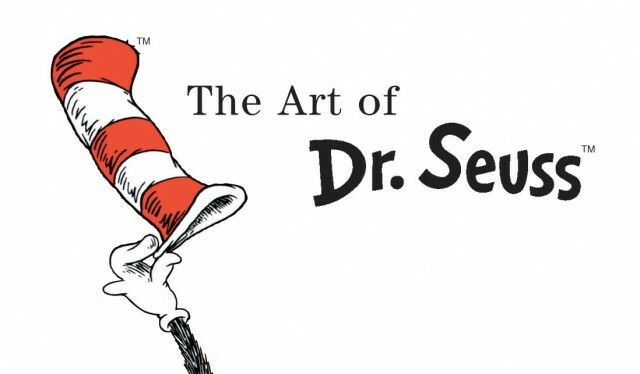 For a full list of all the arts offerings in La Jolla, be sure to check out the Arts Month San Diego website. With Valentine’s Day only a few days away, we’re usually thinking about chocolates, flowers and maybe a cute little stuffed bear to give to our sweetheart. How about a two-story 180-ton teddy bear? This bear you can’t actually give to someone, but it is pretty cool to see. Do you know where it is? “Bear” as it is called, can be found in a courtyard on campus at UCSD, La Jolla. Tim Hawkinson, the internationally renowned artist created “Bear” by using eight granite boulders. It measures 23 feet 6 inches tall and weighs 180 tons. The torso alone measures 16 by 17 feet and weighs over 100 tons. 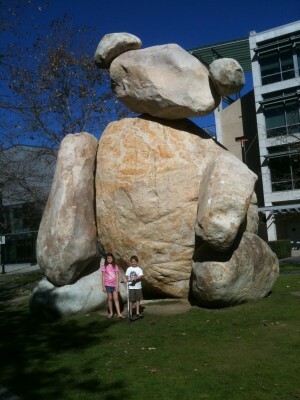 A few days ago, we visited “Bear” in the Academic Courtyard of Jacobs School of Engineering. It was a great day to visit La Jolla and walk around the beautiful campus. “Bear” is tucked sweetly between three very modern looking buildings. When we arrived, there were other non-students visiting the bear and taking pictures with him. I have to say it’s pretty cool to see it up close. His head is titled to the side as if it were looking down at you (if it had eyes of course). Next time you’re in La Jolla, be sure to stop by and say hi to “Bear”.